Have Always Loved Painting Its Magic! 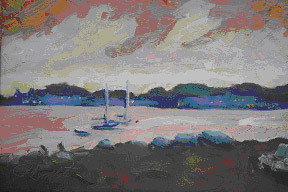 Mackinac Island, Michigan Artists have always found northern Michigan and beautiful Mackinac Island an inspiration to paint. 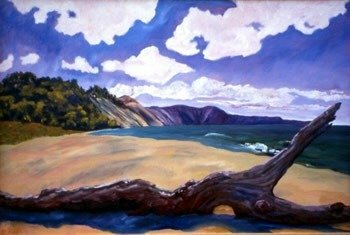 There are so many amazing artists on the island and in northern Michigan. Read and enjoy learning about these incredible creative and talented people...the list will grow so come back to find another artist that will open your eyes and heart to the true beauty of northern Michigan. Oh, and Contact Us about any northern Michigan artists (of any medium) that we should write a page about. The first group of Michigan Artists are painters with deep ties to Mackinac. They call themselves the Mackinac Seven Art Group. The group is comprised of Catherine Brockman, Maeve Croghan, Pam Finkel, Nicki Griffith, Kitty Hannabass, Marta Olson and Pat Pulte. The artists have been painting together since 1994. The Mackinac Island Public Library has been hosting an annual show featuring the group in the month of August since 1996. Don't miss this fun opening or seeing the show...all are welcome! Watch for details in The Town Crier. Expressionist Nature Painter Maeve Croghan has a deep love of Northern Michigan. As a life long summer resident of Mackinac Island, she developed a deep reverence for the lakes and the surrounding lands. She finds a spiritual beauty in this environment. Her love of the lakes is understood in her energetic and color filled paintings. Maeve's oil paintings are begun outside "en plein aire.” She intensely observes the environment, becoming a part of it as she paints. The paintings are then finished in the studio from memory and the painting experience. 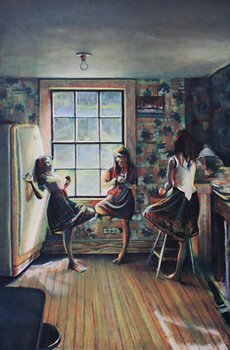 The recipient of numerous awards, Maeve's paintings have been shown in galleries all across the country. Maeve's paintings may be viewed at "Maeve's Arts" gallery on Mackinac Island, Michigan and in galleries in Northern California where she lives in the winter. She can be reached at 906-847-6297 (summer) and at 415-775-6374 (winter). Pam Finkel has lived and painted on Mackinac Island since 1981. I love playing with colors and experimenting with what they do to each other. The images and scenes always zero in on the simple images that are stopped in time doing something that is ordinary and not complicated. My painting is about revealing myself intimately while connecting with people through shared experiences. Painting is simply the best way I’ve found to get along with myself. Pam received a B.F.A. in printmaking from Albion College in 1980 and resides on Mackinac Island. Her artwork can be found on Mackinac at Maeve's Arts Gallery. She can be reached at 231-818-9991. 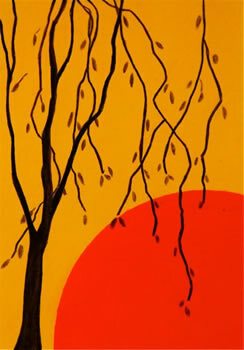 My paintings are about color, shape and simplicity, regardless of the subject matter. I'm always fascinated by the ways that colors can be combined to express emotion or mood and I'm constantly striving for simplicity, both in my art and life. I'm seeking not to reproduce nature, but to portray it in a somewhat abstracted, hopefully poetic way. The beauty of Mackinac Island and Northern Michigan feeds my spirit and soul. Although she has been painting all her life, Nicki has made the making of art a priority and joyful commitment since the late 1980s. She has been exhibiting and selling her work since the early 1990s. Memberships include Mackinac Seven Art Group, Ann Arbor Women Artists, Great Lakes Pastel Society and the Oil Pastel Society. When I tell people that I started painting to become a loose woman, they laugh, but coming from a tight, constrictive background, I figured I would loosen up if I could just paint loose. More than that, however, it is through the flow of music and painting that I can express emotion, finding a way to say those things for which I can find no words. I am committed to finding the deeper meanings of existence. I enjoy painting shallow to seek Wm Blake's world in a grain of sand and infinity in a wildflower, or is it the reverse? Much of what I intend comes from the long years of living on Mackinac Island, a wondrous place which from my early years I thought of as a sort of microcosm for the entire world. Marta Olson is a lifetime summer resident of Mackinac Island. She has enjoyed photography since a young child and in 1994 turned her creative expression to painting. She is primarily self-taught and loves the process of experimenting on her own with new techniques and approaches. Mackinac offers her limitless opportunities to express her appreciation of the northern landscape. Marta owns a web design business, Mintaka Design, which specializes in creating web sites for small and medium sized businesses, individuals, and nonprofit organizations. Her web work offers yet another outlet for creativity. She can be reached at 906-847-6359(summer)and 231-526-5064(winter). Pat has been painting since the early 1990s. He took painting up on a whim and found out soon after that painting is much more than just a hobby. He is now a full time artist! Pat paints the scenes of Mackinac Island in the summer but is receptive to anything that captures his eye. Pat sells many paintings where he is represented at the Mackinac Island Art Gallery located in the Murray Hotel on Main Street, Mackinac Island, Michigan. Pat's paintings are a piece of Mackinac that will last a lifetime. (Not to mention, he was recently voted the number one painter in America by his little grandson Hugo.) He can be reached at (800) 462-2546. 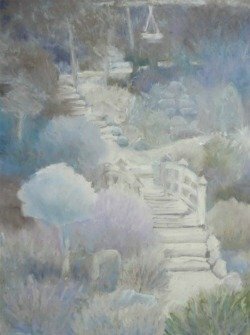 Another member of this extraordinary group of Michigan artists is Catherine Brockman who according to her, "My paintings are my bio." She can be reached at 906-847-3254. 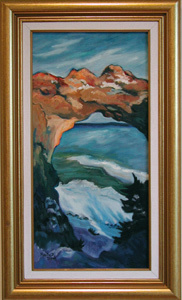 Read about Mackinac Island, Michigan Artists Who Love to Paint in Oils...Sharon Griffes Tarr is one! Visit the beautiful Mackinac Island Manoogian Art Museum to See Other Michigan Artists.